Today is reveal day for the 5th annual Great Food Blogger Cookie Swap, a fund raising event benefiting Cookies for Kids’ Cancer! This year alone, 400+ food bloggers and three wonderful corporate sponsors have raised over $7,000. This year’s Monday Box cookie swap recipe is for chocolate dipped Honey Gingerbread Cookies; chewy cookies with lots of honey flavor warmed with cinnamon and ginger. These cookies are made with an easy-to-work-with dough that makes using a cookie stamp or mold a breeze! 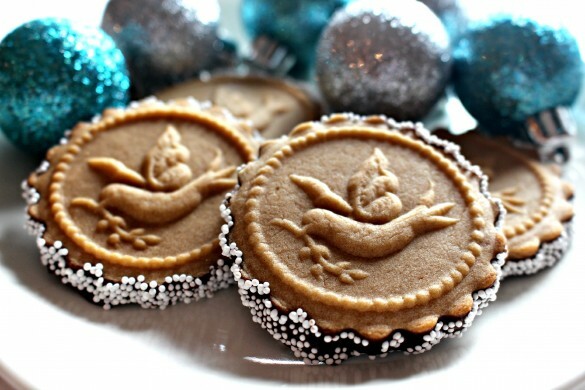 The Monday Box has participated in this fun blogger cookie exchange for the past four years. In addition to raising funds for an important cause, the swap is a great way to make new blogging friends. Each blogger participating in the swap sent out three dozen cookies, a box of twelve cookies each to three assigned food bloggers. In return, each blogger receives three dozen cookies (a box of twelve cookies from three different food bloggers). That’s a LOT of cookies! 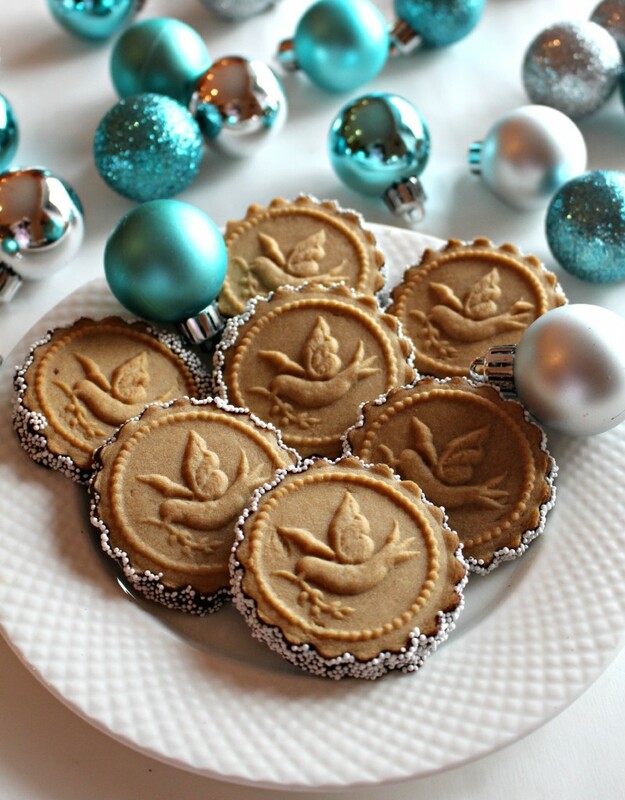 Today all of the participants will post their cookie swap recipes on their own blogs. This week end, Julie and Lindsay, who organize and orchestrate the swap, will post a round-up of all 476 recipes! Once the round-up is posted, I will update a direct link here. I was the lucky recipient of three packages of cookie deliciousness. Stephanie at Worth Whisking sent Rum Balls, a truffle-like treat full of chocolate and pecans. Jacque at 5 O’clock Fashionistas baked Dark Chocolate Amaretto Cookies, a chocolaty side-kick for your next cup of coffee. Gaby from Gab Eats shared Dark Chocolate Cookies with Saltine Toffee Chunks; crunchy, chocolaty, and addicting. Thank you, Stephanie, Jacque, and Gaby, for sweetening my mailbox! Each year, as the cookie swap approaches, I ponder what cookie to send from The Monday Box. I try to make the gift special, a tasty cookie that holds up to care package travel, and stands out on a cookie tray once it arrives. Each recipe I have chosen has taught me new skills. I’ve posted about my adventures with Chocolate Marshmallow (Mallomar) Cookies, Smiling Snowmen Cookie Stacks, and Double Dipped Chocolate Shortbread Cookies. This year, I decided to tackle cookie stamps/molds. The beauty of a stamped cookie is hard to beat, and for a long time, I have wanted to learn how to create them. Just like many things, using cookie molds turns out to be easy, once you know how. It helped a lot that I did my research and found a wonderful book by an expert to help me choose the right recipe for a cookie mold beginner. 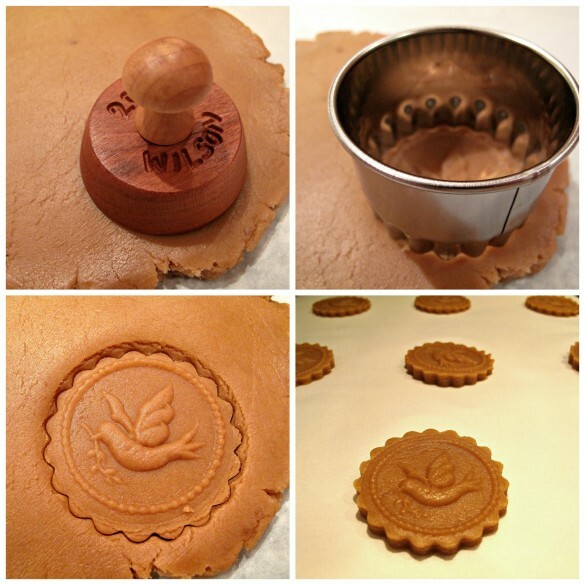 Baking with Cookie Molds by Anne L. Watson is a must for anyone interested in creating molded and stamped cookies. (And possibly starting a new collection/hoard of cookie molds?) This book clearly explains the art of using cookie molds and provides lots of photos. There are trouble shooting tips and methods for avoiding the trouble in the first place. These Honey Gingerbread Cookies are my first attempt with cookie molds, and I am delighted with the results. I think I am hooked! This Friday, I am going to a German-style Christmas fair in Belleville, Illinois because Hobi Cookie Molds (the artist who carved this Peace Dove mold) will be there. Chances are good my new collection will grow. This Honey Gingerbread dough is very easy to work with. Though it’s a great dough to use as I did with a cookie mold, Honey Gingerbread Cookies could be made super easily as simple cut-out cookies as well. Several of the ingredients are chosen specifically to make cookie molding easier. Butter can be used in this recipe, however, margarine (due to its higher melting point) makes the dough easier to work with because it stays firm longer without needing to be re-chilled. The use of a liquid sweetener, in this case honey, helps with unmolding the cookies. I use Chocoley.com Dipping and Coating chocolate for coating the bottoms of the cookies. I love the real chocolate flavor, smooth melting, and the beauty of the finished product. I’m especially enjoying learning about the international traditions associated with cookie stamps and molds. This recipe is close to the types of cookies made at Christmas in the Netherlands, often stamped with windmills. Honey Gingerbread Cookies are a great care package cookie. They retain their chewiness for weeks and the cinnamon-ginger flavor gets better and better over time. Next, I plan to work on German Springerle, another great care package cookie! I hope the three bloggers who received my Honey Gingerbread Cookies (Laura at Main Line Feast, Rebekah at Kitchen Gidget, and Laura at The Road to Crazy) enjoyed them as much as we did! In a small bowl, melt the margarine in the microwave. Cool slightly. In a large bowl, mix together the beaten egg, honey, milk, and vanilla. In a medium bowl, stir to combine the brown sugar, cinnamon, ginger, and salt. Beat into the egg mixture. Slowly mix in the melted margarine. Gradually add in the flour, just until the dough is a solid kneading consistency. Knead the dough, adding more flour as needed, to form a soft, slightly sticky dough. Wrap the dough in plastic wrap and refrigerate until firm but pliable (about 30 minutes). When ready to bake, preheat oven to 350° F. Line a baking sheet with parchment paper. Work with one half of the dough and keep the other half refrigerated until needed. Roll out the dough, between two sheets of plastic wrap or parchment paper, to slightly thicker than ¼”. 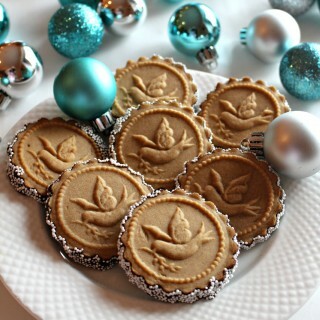 One cookie at a time, press the cookie stamp/mold into the dough, then use a circle cookie cutter to cut out the design. Move the cookie onto the prepared cookie sheet before repeating for the next cookie. Place cookies at least 1” apart on the cookie sheet. When the baking sheet is full, refrigerate for 15 minutes, then bake for 10-12 minutes until the bottom edges turn golden. Cool for 10 minutes on the baking sheet before transferring to a wire rack to cool completely. FOR OPTIONAL DECORATING WITH CHOCOLATE AND SPRINKLES: Line several rimmed baking sheets with wax paper. The baking sheets need to be rimmed to contain the excess sprinkles that do not stick to the cookies. In a bowl wider than the cookies, melt the chocolate in the microwave at 50% power for one minute. Stir. Continue to microwave for ten second intervals until all of the chocolate is melted. Place a cookie on to the chocolate to coat the bottom. Remove the cookie using 2 forks or a spatula, and place on the prepared lined baking sheet. Immediately sprinkle nonpareils onto the melted chocolate on the sides of the cookie. When about 6 cookies have been completed, put the baking sheet into the refrigerator for 10-15 minutes to set the melted chocolate. Store in an airtight container at room temperature. Separate layers of cookies with wax paper. The flavor of these cookies improve with age for at least 2 weeks. Layer cookies between sheets of wax paper in an airtight container. Use wadded up tissue paper or wax paper between the top layer of cookies and the top of the container to prevent any movement in transit. The Monday Box participates in the Amazon Affiliate Program. If you chose to purchase a product after following a link on this page, I will receive a small commission, at no cost to you, which helps make The Monday Box possible. These cookies are sensational, Wendy! So eye-catching and what a beautiful mold that is. I am totally intrigued. It looks like a very elegant way to create a decorated cookie. And I do not know how you managed to dip the cookies so perfectly up and around the groves of the cookie! The use of a fluted cutter was an excellent idea…I love how it looks. Just beautiful and a treat to receive in the mail, for sure. Wendy, these cookies look pretty and delicious! I have not used cookie stamps before, but your post has inspired me to try! 🙂 So glad we were able to connect via the Cookie Swap! Thank you, Stephanie! The photo of your delicious Rum Balls shows one rum ball missing from the package because it was already eaten before I could get my camera! I hope you will try cookie stamps. There are so many different recipes that can be used with them! Your cookies are beautiful! I’ve never made stamped/molded cookies. You have inspired me to try it. I’m going to keep repeating, “You do not need a cookie stamp collection” to myself and see if I can convince myself of that. Such pretty cookies Wendy. They look perfect. I love the idea of using a fluted cutter. It just takes the cookies to the next level. I participated in the Food Blogger Cookie swap a few years ago. I just ran out of time this year. I have a few cookie stamps but you have me thinking I might need a few more!! Wow, these are stunning! I love how you made these even fancier by dipping them in chocolate and sprinkles. 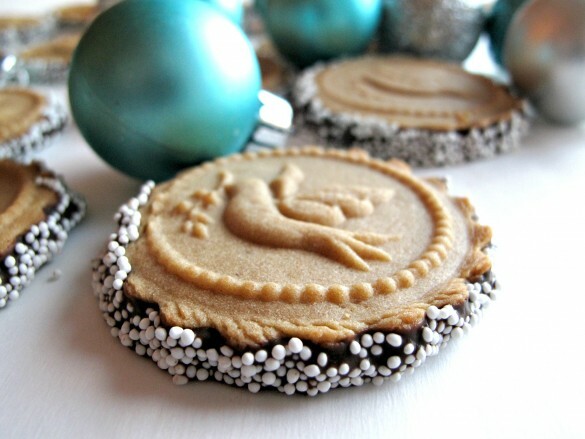 I’ve never made stamped cookies, but now I want to give it a try! You are an artist Wendy – these cookies look picture perfect! I bet your recipients were thrilled! I love the sound of this dough – pinning for next year! So pretty – Happy holidays! These cookies are most definitely a work of art Wendy! I imagine anyone who had the pleasure of opening up a box of these would be delighted! Love, love, love your beautiful mold too! Thank you, Chris! I am new to cookie stamps and molds but the beautiful results have me addicted already! You have to check out the website for the wood carver who made the mold at cookiemolds.com . Coincidentally, Sue Moran at View From Great Island just did a beautiful post all about him! These are exquisite Wendy! They would certainly be the first to catch my eye on a cookie platter! I’d almost hate to eat them. Your recipients are so lucky. I have a few stamps that I bought on a whim but have never used them. . . I definitely need to change that! The flavors sound delicious too! Thanks, Reeni! I have had 6 or more cookie stamps of various kinds sitting in my cookie cutter drawer forever. I never used them because I thought it would be complicated. Then I saw a lady make springerle cookies, bought a great book, and got started down the road to cookie stamp and mold addiction! 🙂 Its easy, much easier than royal icing decorating, and I love the results. Give your stamp a try! I finally received your cookies! The post office sent them back for some reason…that’s military mail for you. However, even after 4 WEEKS the cookies were still completely in tact, FRESH and delicious (and absolutely gorgeous)! Thank you so much and consider me a loyal Monday Box fan! Oh, Rebekah! I am sooo sorry your cookies took so long to get to you!! I have some experience with military mail, and though I think it is a true miracle that they are able to find so many troops and their families all over the globe, I also know that every military package I send, I cross my fingers that the package gets there (eventually) and that it finds its recipient well (MOST important!). As I am sure you are all too aware, not every cookie is edible after a month. I am beyond delighted that these were still yummy. 🙂 I hope you had a wonderful Christmas and send you wishes for a sweet and peace-filled New Year! I look forward to enjoying your mouth watering recipes on Kitchen Gidget! beautiful! These cookies look like you spent a fortune on them and yet so easy to make! love the dove stamp! I am sure everyone that receives these feels the love! Thanks for linking to the Christmas in July hop! Thank you, Millie! I was so happy with the way my first time efforts turned out. 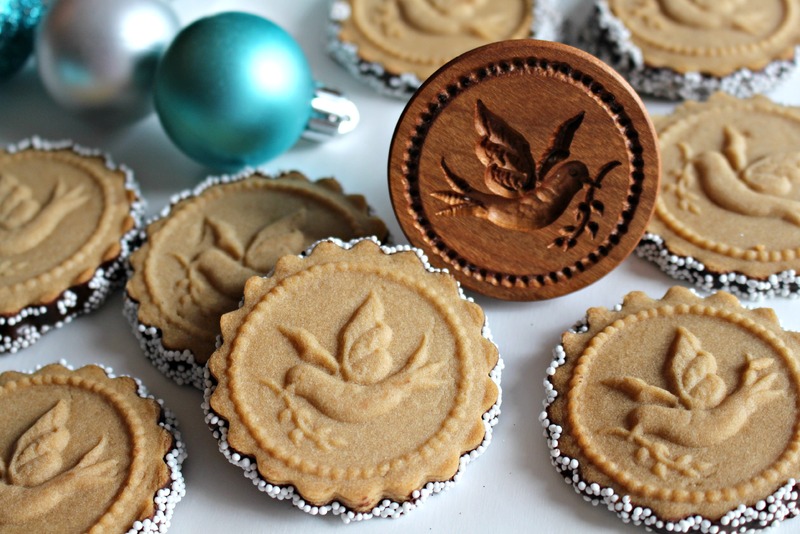 The stamp maker does beautiful work, and his stamps make beautiful cookies! officially too pretty to eat! Thanks for sharing at Celebrate365 Cookie Exchange! Thanks so much, Jan! I was so happy with this recipe because this was my first attempt at stamped cookies and they came out lovely, even for a beginner! Did anyone actually try making these cookies, they do not have much flavor at all. I threw out the rest of the cookie dough, I did not finish making them, not good at all. I’m sorry you didn’t like these cookies, but I can assure you that they have been tried and enjoyed by others. 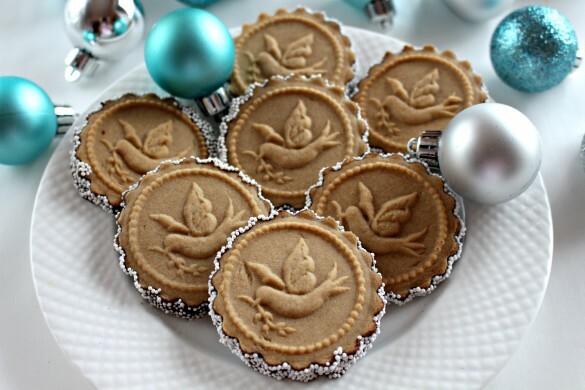 This recipe is especially formulated for use with cookie molds or stamps. The consistency of the dough makes it possible to create a raised image without the dough sticking to the mold and without the image disappearing during baking. Rather than throw out dough, I suggest adding more spices if the level of spices is not to your taste. There are 4 teaspoons of spice and flavoring (quite a bit) in the recipe.